Orlando, FL - 2013 Genitourinary Cancers Symposium - Orlando, FL: Dana E. Rathkopf, MD discusses Updated interim analysis (IA) of COU-AA-302, a randomized phase III study of abiraterone acetate (AA) in patients (pts) with metastatic castration-resistant prostate cancer (mCRPC) without prior chemotherapy during the Oral Abstract Session A: Prostate Cancer at the Genitourinary Cancers Symposium 2013 here today, Thursday February 14, 2013. The Symposium is supported by ASCO, the American Society of Clinical Oncology, ASTRO, the American Society of Radiation Oncology and SUO, the Society of Urologic Oncology. 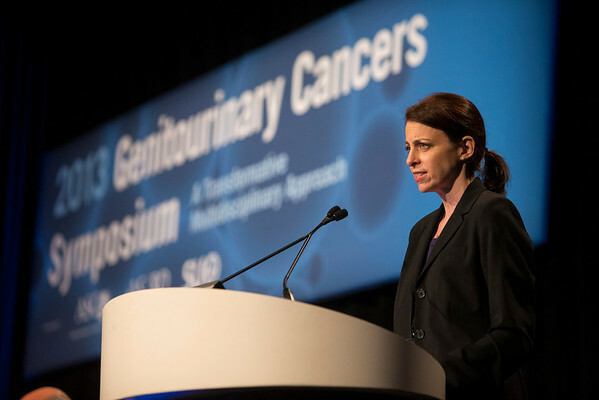 Over 2,500 physicians, researchers and allied healthcare professionals are attending the meeting which is being held at the Rosen Shingle Creek in Orlando and features the latest Genitourinary Cancers research in the areas of basic and clinical science. Date: Thursday February 14, 2013. Photo by © ASCO/Todd Buchanan 2013 Technical Questions: todd@medmeetingimages.com; Phone: 612-226-5154.